January 31, 2011 - With the cascade of issues affecting regional airlines, leaders from the Air Line Pilots Association, Int’l (ALPA) US Airways Express carriers on Friday took significant steps toward finalizing an alliance to address matters of primary interest to the careers of “express level” pilots within the US Airways brand. US Airways Express is an airline brand name, rather than a fully certified airline, and as such, the US Airways Express name is used by several individually owned airlines or airline holding companies which provide regional airline and commuter service for US Airways. 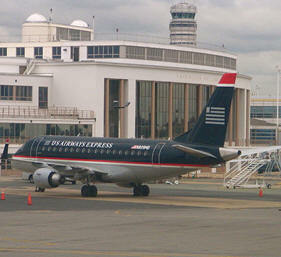 Operations are conducted from smaller markets in the United States, Canada, and the Bahamas primarily centered around US Airways major airline hubs and focus city stations at Charlotte/Douglas International Airport, LaGuardia Airport, Philadelphia International Airport, Phoenix Sky Harbor International Airport, and Ronald Reagan Washington National Airport. Union leaders from the seven pilot groups, all represented by ALPA, formalized an alliance– the US Airways Express Pilots Alliance (USEPA) – by electing officers to spearhead their efforts and prioritizing critical issues they will address in the coming year. USEPA members include ALPA pilots from Air Wisconsin, Colgan, Mesaba Airlines, Mesa Air Group, Piedmont Airlines, PSA Airlines, and Trans States Airlines. First Officer Marcin Kolodziejczyk will serve as chairman of the alliance. He has spent the past five years as a Phoenix-based CRJ pilot for Mesa Air Group. F/O Kolodziejczyk currently holds the position of chairman of the ALPA unit at Mesa Air Group. In addition to his executive role as the pilots’ chairman, he serves as the first officer representative for pilots based in Phoenix and Hawaii. He has also served as the pilots’ vice-chairman, executive administrator, and on several ALPA committees. Capt. Richard Swindell was elected to serve as vice-chairman. Capt. Swindell is currently a Washington, DC-based CRJ200 pilot for Air Wisconsin Airlines, where he has been employed for seven years. He is currently the vice-chairman for the ALPA unit at Air Wisconsin and had previously served as the pilot group’s communications chairman. First Officer Mark Hinczynski will serve as secretary-treasurer for the alliance. F/O Hinczynski has been with PSA Airlines for four years where he is a Charlotte-based CRJ200/700 pilot. He currently serves as the secretary-treasurer for the ALPA unit at PSA Airlines. He has also served on the Hotel Committee for the pilot group. ALPA represents 53,000 pilots at 38 airlines in the U.S. and Canada, including the approximately 4,000 pilots flying as US Airways Express for Air Wisconsin, Colgan, Mesaba Airlines, Mesa Air Group, Piedmont Airlines, PSA Airlines, and Trans States Airlines.